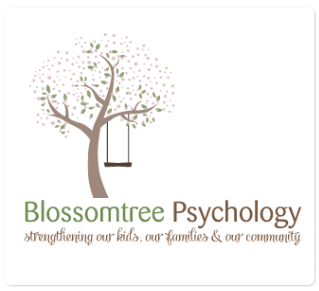 Blosso﻿mtree Psychology was bor﻿n o﻿ut of a shared passion and desire to help others. Chelle and Jess, the founders of Blossomtree Psychology, were both born and raised in country Victoria. We have often reflected on our experiences of being raised not only by our families, but also by our rural communities, and the strong influence this upbringing has had on the paths we have taken in our lives. We have experienced first hand the concept that ‘it takes a village to raise a child’ and it is this ideal that drives us to want to give back to our local community by supporting the children, adolescents and families who make up our community. We chose the Blossomtree to represent our way of working; as for both of us it has significant meaning. While it is a symbol from our own childhoods, the Blossomtree’s life cycle also represents the opportunity for regeneration, and growth, and shows us that with support, nurture and guidance, we and those we work with, can find a renewed strength and be given the opportunity to blossom. In the years we have been practising as psychologists there has been no greater gift than the privilege of being invited into the journey of growth and to walk that path alongside the children and families we work with. In all of the work we do we carry with us the powerful lessons that these children and their families have taught us through their journey. We know that it is important for children, adolescents and their families to feel supported, and we work to ensure that each and everyone we work with feel heard, safe and respected. Chelle and Jess are thrilled to work together to strengthen our kids, our families and our community.